With dozens of booths representing different authors, newspapers, radio stations, and more, patrons scurried about, visiting as many as they possibly could in this weather. Naturally, those that provided the best protection from the rain seemed to receive the highest patronage. After a brief stop at the information desk, I darted in a makeshift book store (I believe it Skylight Books) to decide my next course of action. As I thumbed through the list of scheduled talks and events, I found myself in a bit of a conundrum. There are only so many hours in the day, and the festival offered way too many things that caught my eye. Since I was feeling adventurous and rather outdoorsy, I settled on a very helpful talk from the National Park Service at the Travel Smart Stage. Fitting for the National Park Service, the stage was open air, and on it, Michael Liang, dressed in the green and khaki uniform seen across the country. Liang immediately addressed several challenging issues the National Park Service faces: poor attendance, park disrepair, and underrepresentation of minority visitors. After a brief Q&A, the talk ended in a fun game of “Name that Park” with images selected by Reynolds and guessed by Liang. The talk left the audience eager to see and protect a precious national resource. As a new resident of Southern California, this event marked the beginning of my stay in a new home. This was by far the closest I have ever been to such an incident. It left me feeling—disoriented, to say the least. As many remember, there was initially very little information about the shooters and the victims. I wanted immediate answers to my questions and concerns. Why was it taking so long for news agencies to give us answers? This conversation shed some much needed light on reporting and the ethics of reporting. One of cornerstones of the conversation was on deciding what to report. It was decided that the San Bernardino Shooting was a story worth reporting. As reporters, the group of panelists commented that they are often faced with tragedy and reporting tragedy. How do you justify sharing someone’s personal tragedy to the world? The general consensus to this question was a question. “What if I don’t tell this story?” This question was asked again and again, with the feeling of a mantra. What if the San Bernardino Shooting had never been reported? Another theme the panelists touched on was responsible reporting. I often don’t take the time to reflect on the amount of time and research required to tell a story such as this. The audience was educated on the amount of information or lack thereof that reporters have to sift through in order to make a story digestible to their readership. They discussed speculations and how experience teaches reporters what to pursue and what is the responsible or factual item to report. They talked about their families and admitted that at times personal relationships affect how and what they report. It was refreshing seeing the unfiltered humanity behind the prestige that is the LA Times. This was a 45-minute talk on food and speculation on how and what we will feed ourselves in the near future. No, it wasn’t science fiction with hints of soylent green being just around the corner. It was these authors’ opinions, based on years of experience. The general consensus and theme amongst the panelists was that more and better food education is needed. In the United States there is a great disconnect between farm and table, and it needs to be bridged to live healthier and more environmentally conscious lives. They were far from uniform in their opinion on how to achieve this. Sara Smith advocated for technology in the form of handheld mobile devices to help consumers understand the quality and history of their food. Smith discussed recent advancements in handheld scanners, allowing consumers to determine the freshness and origin of their food by scanning a barcode. 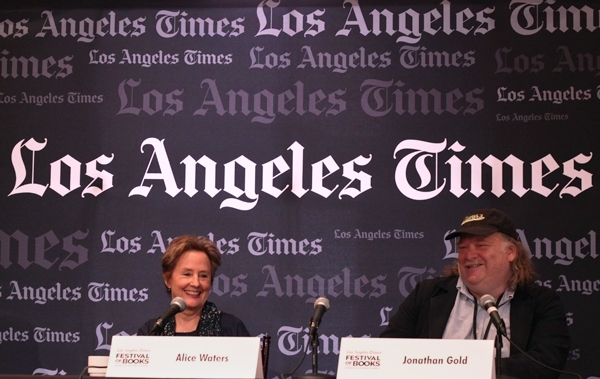 Alice Waters and Jonathan Gold seemed to prefer personal knowledge gained through experience. Waters is pushing for early food education in elementary schools. Gold emphasized the importance of labeling foods as well. Many items were discussed amongst the panelists, giving the talk the feel of conversation amongst friends who all love food. And of course, Masumoto professed his love for peaches at every given opportunity. They discussed the California drought and its effects on farming, stricter environmental regulations, and moratoriums on fishing certain species of fish. The talk ended with a few quick questions from the audience. Leaving, I didn’t feel like the future of food was dark, green, or bright—just something we need work at to make better.